Ahhh, chilling out in the pool ... but don't forget to do regular maintenance! Regular maintenance helps vinyl pool liners last for years. (Neglect is the primary reason they don't.) Here's a simple schedule you can use, followed by information on water chemistry, cleaning, and opening and closing pools. Test the pH and chlorine level. Skim the surface, vacuum the bottom, then brush the sides clean—in that order. Clean the pool deck and surrounding areas; this helps keep the pool clean. Add chlorine tablets and maintenance doses of clarifier, metal control, and algaecide. Shock the pool; do so in the evening. Clean the water line and inside skimmer walls with tile and vinyl cleaner. Proper water chemistry is essential to maximize the lifespan and appearance of a vinyl pool liner. 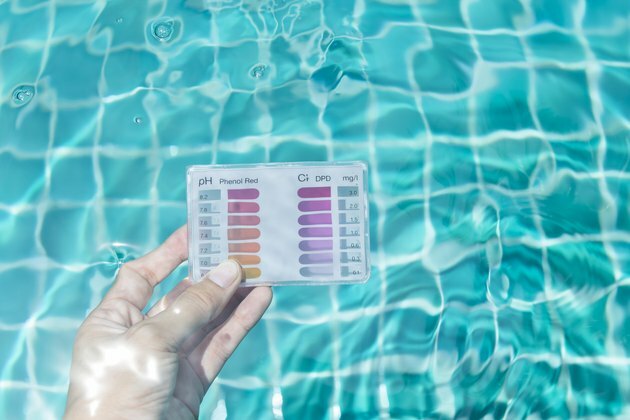 Regular analysis of pool water is necessary for determining and then correcting the chemical levels in the water, and you'll need a water-testing kit to do this. Use 7-way test strips or a 5-way test kit. Sunlight, debris, dirt, and usage by people all can affect chlorine and pH levels, so they can change quickly. Test your pool water daily and in several different areas of the pool, because chemical concentrations vary by location. Test pH and chlorine daily, total alkalinity weekly, and calcium hardness and cyanuric acid levels monthly. Follow the recommendations of your liner's manufacturer to adjust chemical balances in your water and achieve proper pH, total alkalinity, calcium hardness, free chlorine residual, and cyanuric acid. 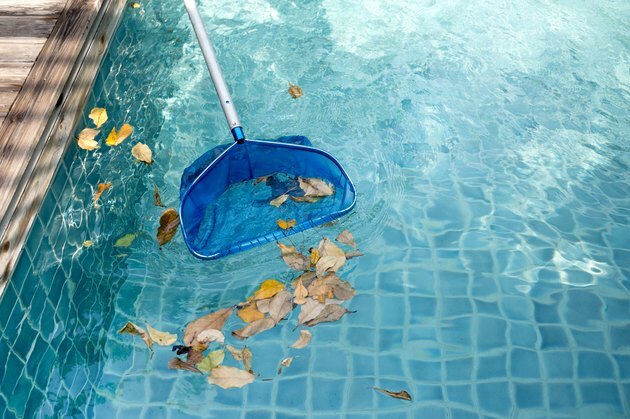 Invest in a leaf skimmer, tile and vinyl cleaner, a pool brush, and a vacuum. When the pool brush is no longer in good condition, replace it; worn-down bristles create rough edges that can damage the pool liner. Liners can get caught in vacuum cleaner wheels and tear, so consult with your pool professional. At the waterline, dirt, minerals, sunscreen, and body oils will form a ring of grime around the pool liner, shortening its life. Prevent this by wiping the waterline with a sponge. If buildup occurs, it's better to use alkaline cleaning agents; acid-based cleaners leave behind residues that accelerate the breakdown of the plasticizer and stabilizer in the vinyl, significantly shortening its life. Never use kitchen or automotive cleaners, or abrasive tools like steel wool, steel brushes, or scouring pads. Pool supply stores sell two types of specially formulated tile and vinyl cleansers. Chemical cleaners break down grease and oils, and also work well on stains, while enzyme cleaners essentially digest the ring. Simply spray on the cleaner, wipe with a rag, then rinse it with pool water. Ascorbic acid (vitamin C) is a mild acid available in pool supply stores. It removes stains and discoloration without harming vinyl. Mix some with a little water to create a solution and spread it on discolored areas. Leave it on for a few minutes, scrub with a brush, then rinse thoroughly. 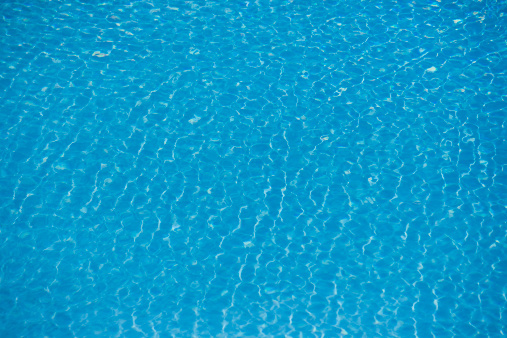 Skim the surface of your pool weekly, along with vacuuming and brushing it. Scrub with a sudsy solution of dish soap, warm water, and white vinegar. Rinse thoroughly. Gently scrub grime in a rotating motion using a wet melamine sponge (sold under the brand name Magic Eraser, among others). No soap or other cleaning product required. Remove mildew and stubborn stains with undiluted white vinegar. Apply this mild acid with a rag or sponge, leave it on for a few minutes, then scrub with a brush. Rinse thoroughly. Borax (sold with laundry supplies) also removes stains. Mix some with warm water to make a thick paste. Apply, leave it on for several minutes, then scrub gently and rinse thoroughly. Test first in an inconspicuous area, because it may lighten colored liners. If toys not designed for pools, street clothes, or pet dogs cut and tear your vinyl liner, you can usually repair the damage with pool vinyl repair products designed to work underwater, available from pool dealers. These maintenance tips will help your vinyl pool liner last longer. 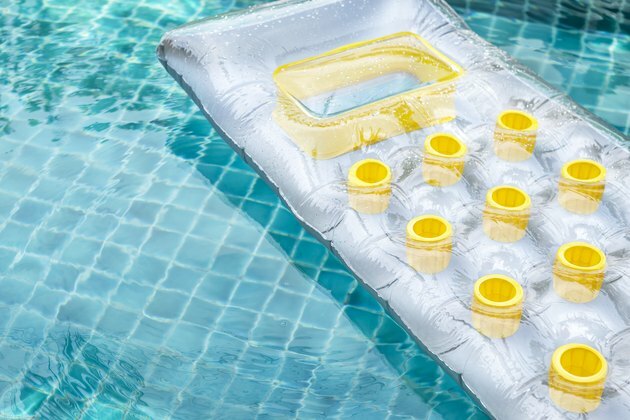 Don't put off opening your pool until it's time to use it. Why? When you first uncover it, the horrible green water will tempt you to toss in a gargantuan amount of chemicals to fix the problem as quickly as possible. That's exactly the wrong approach because it's always best to limit the exposure of vinyl liners to chemicals. Instead, open the pool a few weeks before it's warm enough to splash around and put in the correct amount of chemicals to clear the water over time. The vinyl liner in an above-ground pool should get the same level of attention as a liner in an in-ground pool. Add the lowest quantity of chemicals possible to bring the water chemistry to the level recommended by the manufacturer. add algaecide, and circulate the water for 72 hours before shutting the pool down. Lower the water level to 1 inch below the skimmer opening. Skim and brush the pool. In extremely cold climates, add swimming pool anti-freeze. Put on a winter cover that fits well and seals around the entire perimeter of the pool. Can You Add Too Much Floc to Pool Water?